E rnest Albert Garlington (left) died in Coronado, California, on October 16, 1934, and was buried in Arlington National Cemetery in Arlington, Virginia. He was a Second Lieutenant in Company H who was not present at the Battle of the Little Bighorn due to detached service. Benjamin C. Criswell (left) died on October 17, 1921, in Eldorado, Jackson County, Oklahoma, and was buried in the Pleasant Hill Cemetery in Gould, Harmon County, Oklahoma. 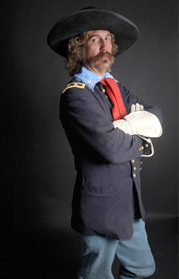 He was a Sergeant with Company B who rode with the pack train and was wounded during the hilltop fight. He was awarded the Medal of Honor on October 5, 1878, for his actions during that fight. Anton Seibelder died at the U. S. Soldiers’ Home in Washington, D.C., on October 18, 1913. He was a Private in Company A who participated in the valley and hilltop fights.